Rain. Snow. Sleet. These are some of the things that you’d normally expect to fall from the sky. But after last week’s meteorite crash in Russia, we started looking into some of the other outlandish things that have reportedly fallen from the skies. How about things like spiders? Frogs? And blood?! Here’s a look at some of these rather bizarre meteorological anomalies. Imagine driving in your car and suddenly thousands of spiders come raining from the sky. Well, that’s exactly what happened to Erick Reis, a 20-year-old web designer from Santo Antonio da Platina, a town about 250 miles west of Sao Paulo. Reis, who was the videographer for his friend’s wedding, had the wherewithal to pull out his video camera and tape the spider torrential which he then posted on YouTube which then became quite the video sensation. And while spider rain sounds like something out of a Hitchcock movie, it’s a phenomenon that’s actually not out of the ordinary. According to biologist Marta Fischer of the Pontifical Catholic University of Parana, the Anelosimus eximius spider, which is about the size of a pencil eraser, usually hangs out in trees and can create webs up to 65 feet high which are used to trap insects. If a strong wind should come along however, the web can become detached sending the spiders aloft which would appear as if they’re raining from the skies which is exactly what Reis was probably witnessing that fateful day. 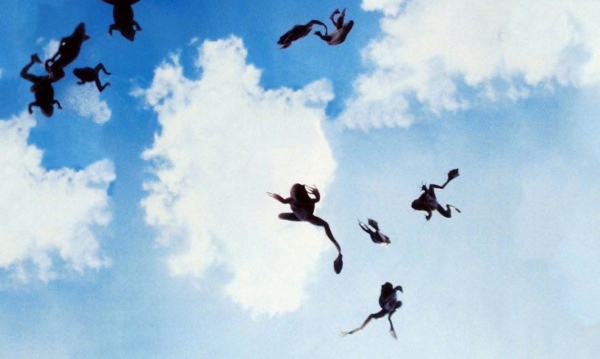 According to the Bible, frogs raining down from the skies is the sign of a horrible curse. According to scientists however, the explanation is a tad more logical. Waterspouts, which is a type of tornado that forms over a body of water (which is where frogs typically hang out) is the culprit here. When a waterspout hits a body of water, the frogs are sucked way up into the funnel and soon become an unwilling passenger in its ride away from its original habitat. Once the wind dies down, the frogs are then released full force which then gives the appearance of frogs raining down from the heavens. Well it wasn’t exactly raining men but on March 3, 1876 in the little Kentucky town of Olympia Springs, it was raining meat. To be exact, the meat, which measured between two and four inches square and appeared to be of the beef variety, rained down in the backyard of one Allen Crouch. It was verified however, after two men bravely stepped forward to taste the meat that rather than beef, the taste was similar to mutton or venison. 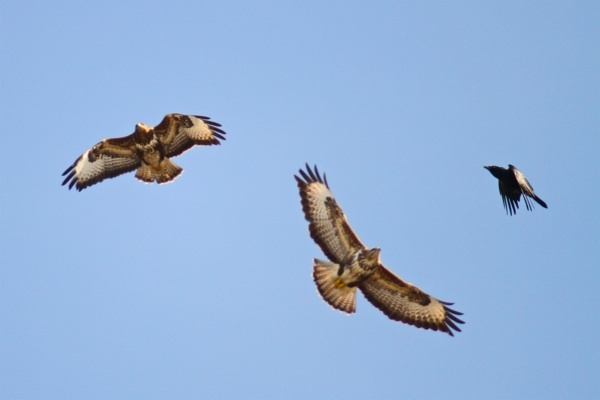 As for how this all occurred, the most probable theory given was that a large pack of buzzards had probably just eaten a pack of dead horses and when one of them expelled the meat, all the other buzzards (which is apparently a buzzard trait) then followed suit. In the 1920s there was a song called “You’re the Cream in my Coffee”. Well in 1969 in the town of Chester, South Carolina, there was enough cream for everyone’s coffee and it came falling from the skies. 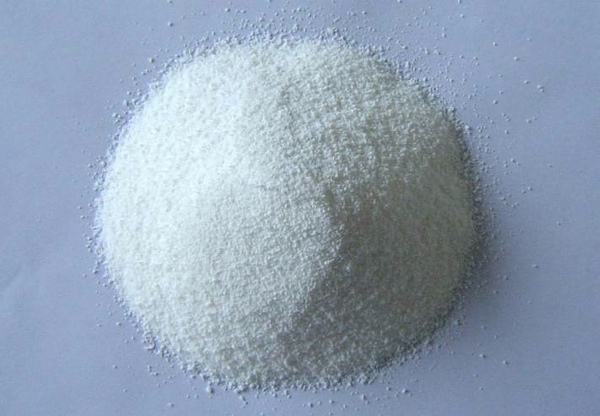 In 1969, the Borden company, which manufactures Cremora, a powdered non-dairy creamer had a problem with its exhaust vents. Every time the vents became clogged, puffs of non-dairy creamer would spew from the air. When the puffs of creamer mixed with rain and dew, the result was a gunky, sticky mess. Thankfully for the town though, the Borden company fixed the problem and was eventually slapped with a $4,000 fine for “releasing Cremora beyond plant boundaries”. On September 1, 1969, golf enthusiasts from Punta Gorda, Florida probably thought they died and went to heaven. 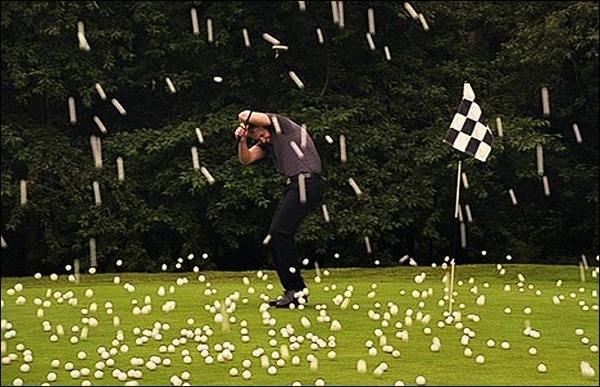 It was on that day that residents woke up to find dozens and dozens of golf balls falling from the skies. Was this some gift from the golfing heavens? Not exactly. According to meteorologists, Punta Gorda, which is located on Florida’s western Gulf coast and is home to many golf courses, probably experienced a passing tornado which gulped up a golf ball filled pond which in turn rained down its contents on the streets of the unsuspecting town. 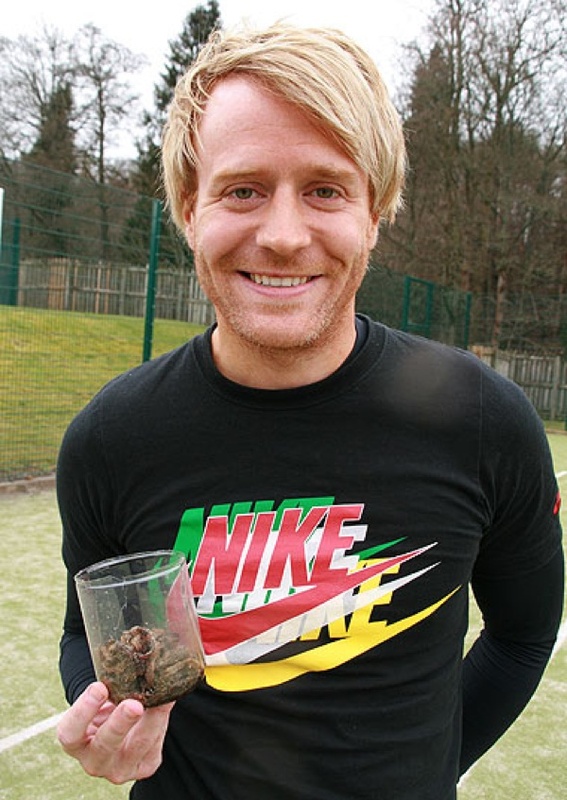 On March 4, 2001 at the Galashiels Academy in the United Kingdom, David Crichton’s soccer class was on the field in the midst of a game when the students were suddenly pelted with dozens of earthworms that seemed to be raining from the sky. Shocked at the sight, some kids were laughing while others went scrambling for cover. Meanwhile, Crichton scooped up handfuls of the worms as evidence of the occurrence. After it was over, Crichton spoke with his science colleagues to determine a cause but none of them had an explanation for it. One teacher thought it was a freaky weather thing but as it turns out it was a sunny clear day. Crichton also noted that the students were far from any buildings so there was no way that it could have been someone’s idea of a practical joke. Now while there has been no clear explanation for this occurrence, weather was to blame for the worm rain that pelted a woman in the town of Jennings, Louisiana in 2007. Eleanor Beal was crossing the street on her way to work when she was suddenly pelted with several large clumps of worms. As Louisiana is prone to sudden tornadoes and rain storms, it’s believed that on that day a water spout was spotted several miles away which carried the worms up and dropped them on the poor, unwitting Beal. The odds of this ever happening is probably one in a bazillion but it did happen to Mary Fuller of San Diego, California. On September 25, 1978 Fuller was sitting in her parked car with her 8-month old son when suddenly a human body crashed through her windshield. Where did the body come from? Unbeknownst to Fuller, Pacific Southwest Airline flight number 182 had just collided with a private Cessna airplane killing 144 people. The body that smashed through Fuller’s windshield was one of the victims. Thankfully Fuller and her son suffered only minor lacerations. To this day this accident is still considered the worst in California aviation history. In 1997 a Japanese fishing trawler was rescued by a Russian patrol boat in the Sea of Japan. When the castaways were asked how their boat came to be in distress they replied “a cow fell from the sky and sank us”. Well of course not believing their story the fishermen were immediately arrested and went to jail. Two weeks later however, an embarrassed member of the Russian air force informed Japanese authorities that one of its crew members had indeed stolen a cow for its beef and took it aboard his flight. 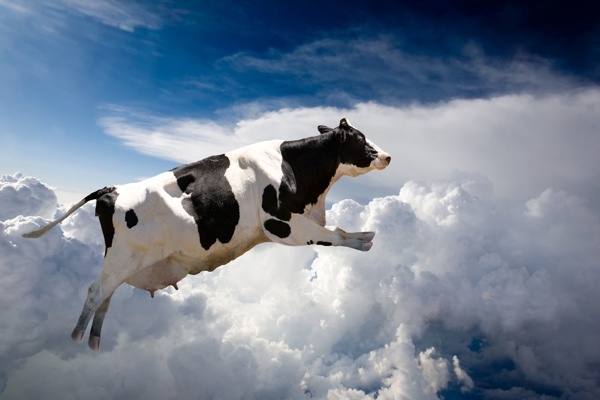 Cows being cows however, don’t like enclosed spaces and definitely don’t like flying so in order to save the aircraft and themselves the airmen threw the poor cow out of the plane at 30,000 feet just as it was flying over the Sea of Japan. The Japanese seamen were immediately released. At one time or another just about everybody wishes that money would literally fall from the skies. A handful of people however, have actually witnessed this miracle. In 1957, thousands of 1000 franc notes seemingly fell from the sky in the small town of Bourges, France. In December 1975 hundreds of one dollar bills totaling $588 fell from the skies over Chicago, Illinois. Outside of a store in Ramsgate England, pennies seemingly fell from the heavens on December 3, 1968. A cashier at the store claimed that they came down in short, scattered bursts for fifteen minutes. No one actually saw them falling but everyone heard the sound of them plinking off the pavement. Even more bizarre was the fact that the coins appeared to be dented as if they fell from a high altitude but there were no tall buildings nor airplanes in the area. On May 28 1981 a girl from Reddish England claimed she saw a 50 pence coin fall from the sky as she walked through St. Elisabeth’s churchyard. Later in the day several other children claimed the same thing happened to them as they all convened at a local candy store. When the store owner called the church Reverend to see if perhaps the children had been stealing from the poor box, the Reverend said no money was missing. When the children were all questioned together they all claimed that the money indeed fell from the sky. In 2008 residents of the small town of La Sierra Choco, Columbia claimed that blood actually rained down on their small community. When a bacteriologist from another town tested a sampling of the substance, it was indeed verified as blood. For his part, Johnny Milton Cordoba, the parish priest of the town claimed that this was a sign from God that people need to change their evil ways.